Well, once again, I'm turning to my favorite celebrity cook for a decadent dessert. This is a Paula Deen recipe, so you know it has to be good, right? Seriously, when I made these, I sent my BFF Paul a text message that I need to make these every day for the rest of my life. They're so delicious! Now, at first, I thought "Why are these called BROWNIES? They're not brown, they're orange! Shouldn't they be called ORANGIES?" But then I made them and it all made sense at the very first bite. When you think of a brownie, you think of something fudgy and moist and a lot richer than a piece of cake, right? These are the orange version of that. They're moist, and rich and they're the orange version of "fudgy". They're the same exact texture as a brownie. YUM! I think you should make them, like, right now. Grease a 13 by 9 by 2-inch pan and set aside. In a mixing bowl, stir together flour, sugar, and salt. Add butter, eggs, orange extract, and orange zest and beat with a mixer until well blended. Pour batter into prepared pan and bake for 30 minutes, or until light golden brown and set. Remove from oven and pierce top of entire cake with a fork. Combine all ingredients in a bowl, stirring until smooth. Pour glaze over brownies. Cool and cut into squares. You can use the glaze as directed above or you can frost the cooled brownies with Orange Cream Cheese Icing. Since I usually use the cream cheese icing for Orange Creamsicle Cake, I opted to use the glaze for the brownies. Dear evil geniuses behind this cooking with Joey fancy schmancy computer type thing the kids are into these days. 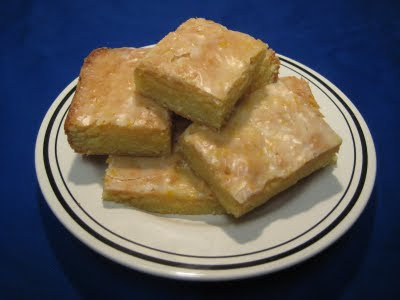 I made your stupid orange brownies and now I'm fat. There should be a warning that says "you can't just eat one. Unless by one you mean one batch. And even then, it's not so easy to stop." Yumm.